Cleopatra – one woman, a lot of legends. Who was this extraordinary last female pharaoh? Was she as beautiful as the movies makes us believe and did she seduce the most powerful men of the Roman Empire with just a flutter of her eyelashes? Cleopatra is a never ending inspiration for writers, artists, movie makers and for fashion as well. 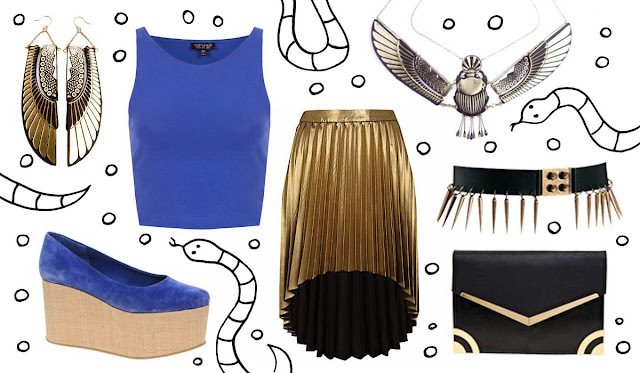 Today I want to show you a modern Cleopatra look. I tried to find a balance between Egyptian opulence and a wearable look. The most important thing for an outfit fit for an Egyptian queen is a lot of gold and sparkling jewellery. Aren't the necklace and earrings from Rosita Bonita just divine? They are very Egyptian, but have a modern graphic edge as well. Scarabs were very popular amulets in ancient Egypt and used as a lucky charm. A Cleopatra from today will not leave the house with at least one scarab amulet too of course. The ancient Egyptians loved gold and their probably most precious gem stone was the blue lapis lazuli stone. That's why my outfit is mostly in gold and royal blue. The pleated skirts reminds me of the winged cape, Elizabeth Taylor had, when she played Cleopatra in the famous movie from 1963. Even if you are no fan of the Egyptian queen, you might like this skirt, because there is a big trend for foiled clothes at the moment. The woven flatform sole of the shoes is a little bit like papyrus. The paper of the ancient Egyptians has nearly the same colour and is made from stripes of fabric too. Clutch and Belt complete the look, both of them bring more gold to the outfit. Are you fascinated by Cleopatra and the ancient Egypt like I am? What do you think about this 21st Century Cleopatra look? Ancient Egypt is such a fascinating time in history! Hiermit lade ich dich ein zum "Best of The Blog"!